The new superintendent of the Minneapolis school district says she wants to make sure parents believe again in public education. Thandiwe Peebles officially began her new job Wednesday by outlining some of her goals in a morning news conference. Peebles will try to raise achievement levels in district that is losing students and money at alarming rates. Minneapolis, Minn. — Thandiwe Peebles has spent 40 years working in urban education. She just left a job as a regional superintendent in Cleveland, where she helped turn around some of the city's most challenging schools. Before that, she worked as an administrator and teacher in New York City. 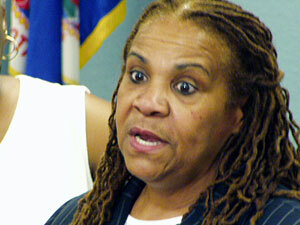 Peebles says her experience tells her the situation in Minneapolis is not as tough as some people think. "When you're in it, it seams monumental to you," Peebles said. "But I move across this nation both as consultant, technical assistant, whatever, and this is a very doable situation. If it wasn't I wouldn't be standing here." Peebles takes over a school district with rapidly declining enrollment. School leaders are expecting 38,000 students this fall, 4,600 fewer than a year ago. The city's school-age population is shrinking. But the district is also losing students to charter schools and neighboring districts, and Peebles says that trend raises a red flag. She says parents don't move students who are succeeding in the classroom. She plans to look closely at academic programs, test scores, attendance, graduation rates and suspensions. The new superintendent is expecting everyone in the city to support the effort to make improvements. Peebles says she wants parents to hold public schools in the highest regard. I think her ability to engage people and get them excited about this work is very valuable, and she can't start too soon. "If we constantly have people taking potshots at the schools or potshots at the superintendent or potshots at the school board, then you have parents who feel like, well it can't be so sacred," Peebles said. "It's almost like throwing stones at the pope. Nobody would throw stones at the pope." Fewer students mean a decrease in state funding, and deeper financial problems for Minneapolis schools. The district cut $23 million from this year's budget and laid off more than 600 teachers. It was the fourth year in a row for big cuts. Peebles says the district must get more out of its existing resources. She's confident she can make a difference in spite of the hurdles before her. "It's tough times in education, and I don't know that we can point fingers," Peebles said. "We can certainly say where the blame may be. But I just want Thandiwe Peebles to be known as the superintendent with her team that under the circumstances we had did the very best job. Not the best job we could, I mean the best job." The leadership of state's largest school district has been up in the air for more than a year. Carol Johnson resigned last summer for a job in Memphis. The school board then hired interim superintendent David Jennings as a permanent replacement. He later turned down the offer after some community activists questioned his qualifications and the board's quick action. School board members choose Peebles a month ago after a national search. They finalized a contract Tuesday that will pay her $163,500 dollars a year plus benefits. Veteran school board member Judy Farmer says she's glad a new superintendent is now on board. She says Peebles brings a much needed excitement and passion to the job. "We've had serious problems, we've had funding problems, we've got very important decisions," Farmer said. "I think her ability to engage people and get them excited about this work is very valuable, and she can't start too soon." Farmer and her school board colleagues will hear more from Peebles about her goals during a planning retreat scheduled for Saturday. The superintendent will present a detailed action plan for her first 90 days on the job.